We’ve been voted one of the best new restaurants by NH Magazine! Salt & Lime is dedicated to making people happy through tasty fresh food that is fast, convenient and accessible. Owner & Chef, Isaac Kaufman keeps mouths watering with his scratch made dishes. We work with local farmers to ensure the sausages and street food we serve to you are free from antibiotics, hormones, nitrates and all the other nasty things we see in bulk made foods today. Our goal is to provide fresh, ingredients — organic and local when available, paired with classic and inventive recipes. Don’t settle for boring – with a squeeze of fresh lime and a touch of salt, our food will excite your tastebuds and have you running back for more. Every dish achieves that elusive, cuisine-defining balance of sweet, salty, and sour. Salt & Lime uses quality ingredients from local farmers whenever possible. 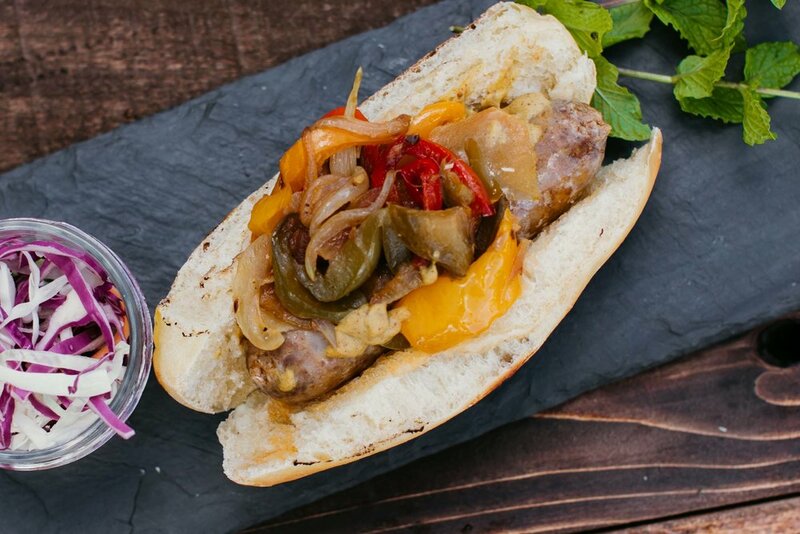 You will feel good knowing the sausages are are pure as can be: free from antibiotics, hormones, nitrates, and made from pasture raise, happy animals. Animals are humanely raised and fed non-GMO feed, pasture based & forest foraged food, and local vegetable scraps. When in season you can find us using certain vegetables from certified organic Picadilly Farm in Winchester, NH. To learn more about our local partners please check out the farm's websites. Archway Farm: Animal Welfare Approved pig farm in Keene, NH specializing in organic heritage breeds such as; Tamworth, Gloucestershire Old Spot, Berkshire, and Chester White; breeds known for their flavor as well as ability to forage. Picadilly Farm: is nestled among the fields and hills of southwestern New Hampshire, right along the Vermont and Massachusetts borders. Owned and operated by Jenny and Bruce Wooster, Picadilly Farm provides certified organic Community Supported Agriculture shares to over 1000 households throughout our tri-state region. Isaac is a veteran in the culinary field. His career started at several restaurants in Keene before, during, and after high school. From there he went on to study at the esteemed New England Culinary Institute in Montpelier, Vermont where graduated with an Associate’s Degree in Culinary Arts. He then went on to build his skills, methods, and techniques at places such as The Montagna in The Little Nell Hotel and Resort in Aspen, Colorado; Todd English’s flagship restaurant Olives; The Savant Project, Mare, Ginger Park and Lionette’s Market in Boston, Massachusetts, and more locally known Nicola’s Trattoria. Isaac was also the opening chef for Keene's Taqueria — Odelay. Not only has he worked in some of the top restaurants in Boston and Colorado, but he's trained under some influential, talented Chef's such as; Todd English, Todd Winer, Patricia Yeo, and Marisa Iocco. These experiences taught him to make a lot out a little, to master food improvisation, to embrace creativity and innovation, and turned him into a confident, aggressive, no holds bar, get things done chef. Isaac's passion for food and flavor is apparent once you taste the complex flavors and textures he pairs together. He turns plated meals into a work of art with bright colors, fun textures and unique style. Salt & Lime is available for off-site private events.